Let me tell you a secret. I had never given blood before I began working at the American Red Cross. I was like a lot of people – nobody ever asked me to give and it had NEVER crossed my mind. I just took for granted that blood was there for people who needed it. That’s the point of the Missing Types campaign: to help people experience when something they take for granted in everyday life goes missing. Through this campaign, the letters A, B and O are disappearing from logos, signs, websites, social media and other public-facing platforms. A few missing letters may not seem like a big deal, but to a hospital patient they mean life. A, B and O make up the main blood groups, and they are disappearing from hospital shelves, too. The message is clear, donors are needed now to help fill the gaps. If you’ve never donated before or haven’t in a while, now is the time to make an appointment to give. If you’ve never given blood before, you might have a lot of questions – and may even be a little nervous. Let me help explain the process. Registration – Sign in, show your ID and read required information. Health check – Answer questions to help determine your eligibility and receive a mini-physical. Donation – Give a pint of blood – it only takes about 8-10 minutes. Refreshments – Enjoy snacks and relax before resuming your day. Still feeling a little hesitant? 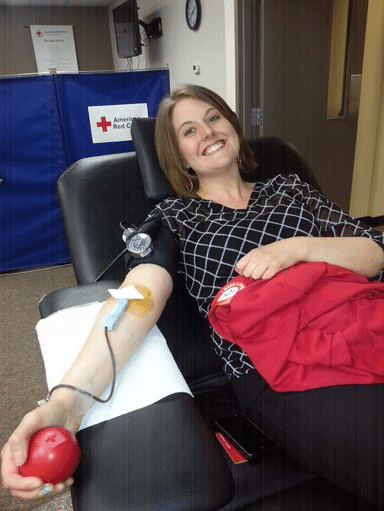 Give your confidence a boost with these tips from some real blood donation pros – our Facebook fans. You can do this! Want more information? Check out the first-time donor section on RedCrossBlood.org. We cover everything from why you are needed and what to expect to who can donate and how to get ready. I can personally tell you that donating is easier than you may think. Since that first donation in 2009, I’ve given 27 times. I’ve also come to personally appreciate just how important donors are. I’ve seen the need for blood and platelets firsthand with a friend fighting breast cancer, a friend’s son who had surgery and my aunt who is currently battling ovarian cancer. I’m so grateful the blood was available when they needed it. If you have never been asked to give blood before – consider this your personal invitation. Join me by making your appointment to donate. Don’t wait until the A’s, B’s and O’s are missing from the hospital shelves. You are the #MissingType.